The. Best. Chicken. Noodle. Soup. Ever. Period. Ever had one of those days when you just want to curl up with some comfort food? Maybe your kid/spouse/boss/in-law/insert-someone-you-can’t-take-a-break-from is getting under your skin? Or a deadline is looming and you’re not even close to being done? Or maybe you’ve just about had it with everything and you need a little something warm to soothe your soul? Or maybe life is awesome and you’re just hungry and would like something tasty and easy? Well, I’ve got the solution for you right here. Get out your slow cooker and read on. 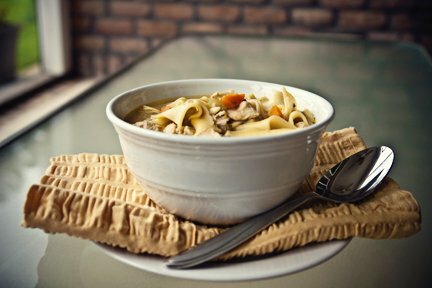 And yes, at the risk of flat-out sounding like a braggart, it really is the best chicken noodle soup I’ve ever tasted. Prep. time: 10 minutes. Cost: Less than $10. Serves: 6 – 8. Add everything except the egg noodles into the Crock-Pot. Cover & cook for 5 hours on HIGH. Add noodles & stir. Cover again and cook for 30 more minutes on HIGH. 6 Responses to "The. Best. Chicken. Noodle. Soup. Ever. Period." Yummm!! I can’t wait to try this. Homemade chicken soup brings back many (heart-warming) memories from my childhood. Thanks for sharing this, Shelli! Hi lovely Heather! I hope you enjoy it as much as the soup your mom made. Let me know how you like it. Cheers, darlin. Doesn’t get easier than this. Will be nice for next winter. Hi Alana! *waves* So true. Crazy easy & great for a cold winter day. Hope you enjoy it! Cheers, darlin.